Ahhhh…what a WONDERFUL night’s sleep! Rode Trip didn’t rock a bit and Brian and I slept the entire night through (aside from Brian’s usual early morning wake for bathroom/check outside which I generally sleep through anyway). We felt refreshed and were thrilled to wake up to a sunny, warm day at North Haven. We went topside for breakfast on the deck and were in for an unexpected treat. A sea plane had just landed and rounded the corner into Kent Cove. It pulled quietly and gracefully around and docked at a house on the end of the cove that we had admired during our kayak yesterday. WOW! I had never seen a sea plane and could only imagine who was on the plane, from where did they arrive, and my goodness who owns this amazing house! We gawked at the plane while finishing breakfast and Brian commented, “gee we’ve got a great view, too bad they chose that corner they’ve got to look at us.” Thank goodness Rode Trip is such a beautiful yacht! After breakfast I took my first ride up in the bosun’s chair. As you will soon learn, we’ve had several snags in our sails…one in particular we patched with sail tape. But, the sail tape on the genoa peeled off while the sail rounded the inner forestay during a tack. So this was Brian’s opportunity to ease me into the bosun’s chair to retrieve the tape now stuck to the inner forestay. I got strapped into the chair and hoisted by the genoa halyard. Very slowly I went higher and higher above the deck and bowsprit. I looked down only once, that was plenty! I peeled off the tape and with my eyes tightly closed Brian eased the halyard for my descend. Yipes! That was like an amusement park ride, thank goodness it doesn’t go upside down! Brian went up next. With the ease of an acrobat he taped each of the spreader ends to cover exposed bolts; this was the cause of another sail snag in the main which is also taped. Brian also added a flag halyard. Once Brian had both feet safely back on deck, he checked the oil while I readied the sails and we were bound for the mainland! We motored through the Fox Island Thorofare once again enjoying the views of modest homes, sailboats of all sizes, and lobster boats. 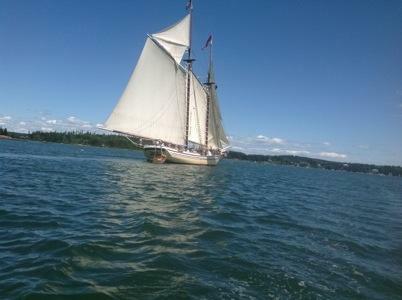 We passed by a Maine Schooner. The Fiddler Ledge marked the end of the thorofare. We set the sails; I stayed at the helm throughout this sail and worked the main a bit to get a feel for the correct point of sail. 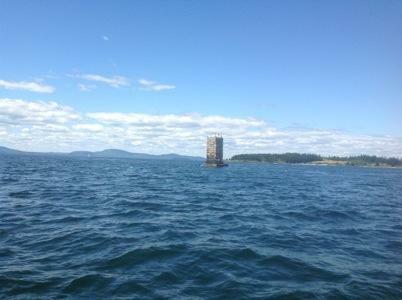 We had a brisk reach across West Penobscot Bay straight into Rockland Harbor. 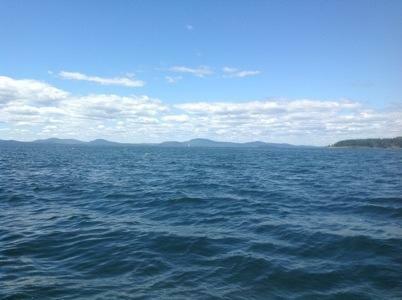 The Camden Hills were our sprawling backdrop as we neared Rockland. 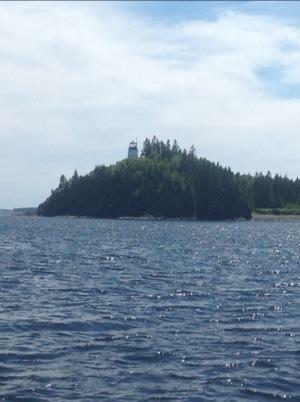 We hugged the south shore while entering Rockland Harbor and had a great view of the Owl Head Lighthouse. This harbor is huge! We sailed nearly to the mooring field before taking down the sails to prepare to anchor. There were boats upon boats sailing this way and that. Busy! It was exhilarating to arrive to this much commotion. Still at the helm I had some good practice steering into the wind while Brian took down the sails; don’t forget this also involves navigating through lobster pots and boats. No sweat! We found a good spot to anchor just near Seal Ledge which had easy access to the public boat ramp. To our dismay, despite having just landed in the middle of such a grand city, there was no 4G to be found! We couldn’t easily research our resources prior to departure. So we kayaked to the public boat launch and walked inland to explore. Many of our logistical questions were answered by Sally at the visitors’ center. We stopped at Hamilton Marine and purchased some necessities from our safety gear list: flares (not expired) and a whistle for my lifejacket. We also purchased a nautical US flag (ensign). As it turns out now that Rode Trip is documented with the US Coast Guard, she does need to fly the ensign daily and we have noticed in comparison to other boats that our flare is lacking. Heading back to Rode Trip we strolled through Rockport, but most of the shops were closed at the late hour of 1800. We made a very special birthday phone call to Bruce – Happy Birthday! And then we headed toward the Shagrock Brewery to celebrate 60th birthday style! Yes of course we found a brewery, hooray! It was aptly named after one of the hazards that we sailed past en-route to Rockland. 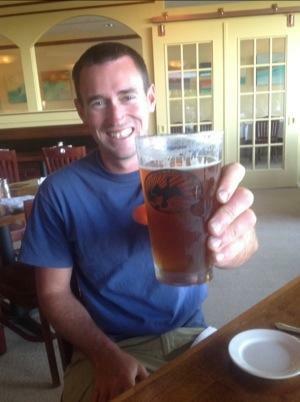 If you make it into the harbor you most certainly deserve a good beer. We sampled the Shagrock IPA and Coffee Stout. Delicious, smooth, flavorful beer! Well done! 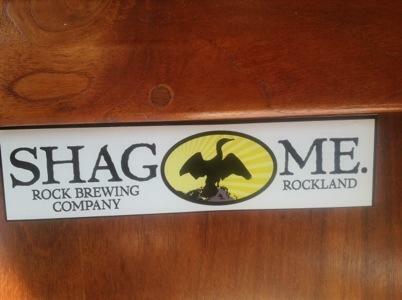 Since it caught our eye to bring us toward the brewery we added the clever “Shag ME” bumper sticker to our sticker wall on Rode Trip. Photo of ‘ensign’ and exactly how it relates to Coast Guard? Would love enlightenment on this!